Old Boys group the '91 group' gifted Rs. 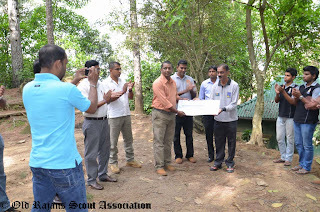 150000.00 to renovation of Campfire circle at the Lake View Park International Scout Centre. The renovation of Lake View Park's Campfire circle started last year targeting to complete by the Feb 2013 before the RISGO Centennial 2013. The campfire circle at Lake View, which is considered to be one of the most pictures campfire circles in the Sri Lanka, will be renovated to be able to host bigger audience. Probably the most active old boys batch group at Dharamaraja, the 91 Group join in hands with the most active old boys association to complete this project. 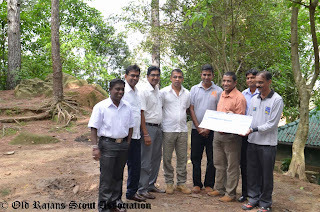 President of the '91 Group' Mr.Ajith Kotuwage together with group members presented to the cheque to Mr. Sarath Mathaarachchi, Deputy Principal of Dharmaraja College.